If you are running late in the morning, what are you gonna grab first in your makeup routine? Apparently, need to wash our face, brush our teeth and then, apply toner beforehand no matter what. After that, make it snappy with basic steps of makeup which we are most accustomed to. Normally, going straight to UV filters infused tinted moisturizer, a little concealer on major imperfections and brow pencil is fine to me. I also get super quick with lip and cheek tint for a healthy, lively appearance. Next, lightly sweep translucent powder over. I may skip contour, eyeshadows or highlighter, unless there is still a bit more time. It’s possibly no eyeliner either, but one thing that I can not drop for sure is my mascara. This is my definite essential. My review this time is about Hourglass Caution Extreme Lash Mascara that I received a couple of weeks ago for testing. 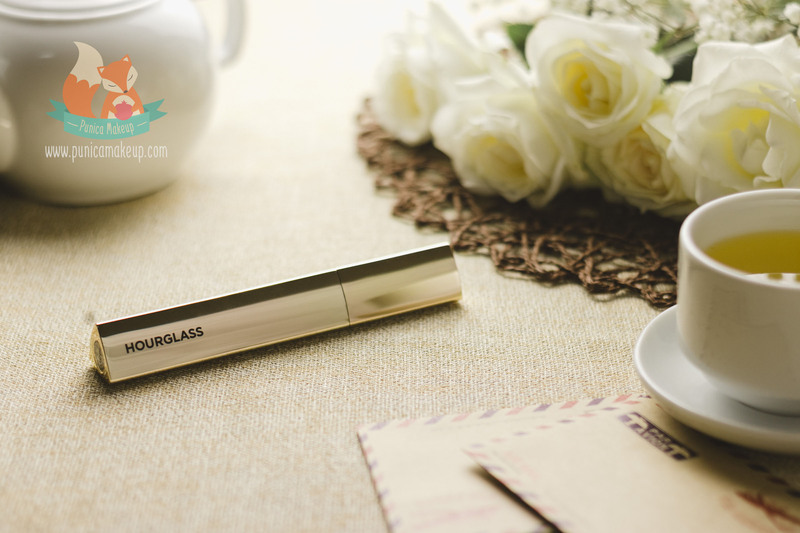 This is Hourglass brand new babe in July 2018. I’m recently using it and so excited to share you all my feelings, whether the product is hit or miss to make things easier to glam us up even in a rush. First of all, give a toast for its packaging, literally jumping out at me and throwing a fancy vibe on my daily basis. Stay tuned, dreamers! The formula comprises a majority of chemicals, especially waxes and polymers, which own volumizing, lengthening and lifting activities. Moreover, there are emulsifiers, solvents, stabilizers, film formers, adhesive agents, bulking agents, viscosity regulating agent and preservatives. All of them tend to maintain the product’s quality. Finally, infused with mineral pigment, Iron Oxide. Carefully read the product description, you can see how fantastic it sounds that you are gonna want to wear it so bad. The product imparts sculpting effects to drastically lift up and elongate your eyelashes in every way. Designed with 4D Amplifier™ brush, which incorporates two brushes in one act to achieve full-angled, precise coats. It promptly results in a fuller, voluminous and highly defined look that is distinguished from what any traditional mascaras can do. “400% more volume in one stroke.” Souped-up with a sleek, extremely buildable, ultra-black, weightless, clump-free and smudge-proof formula. In addition to water (aqua), formulated with Paraffin and Copernicia Cerifera (Carnauba) Wax. These two are very common waxes found in mascara as thickener, film-former and viscosity regulator. The waxes also make the mascara water-resistant, bond to the brush wand, swiftly stick to lashes without clustering. There are Acrylates/Ethylhexyl Acrylate Copolymer, Acrylates Copolymer, Polybutene, Vp/Eicosene Copolymer and PVP. These synthetic polymers are multitaskers to provide film-forming, stabilizing and adhesive activities in mascara. Plus, They help the mascara fast dry and visually add lift to lashes as well as keep the waxes from flaking off. Acrylates is proven to probably cause skin and eye irritation. The slew of polymers and the waxes primarily contribute to volumizing and lengthening effects of the mascara. The formula consists of Palmitic Acid, a saturated fatty acid, which mixed with waxes to become an emulsifier. That prevents separation between water soluble and non-water soluble elements. Another popular emulsifier is Stearic Acid, a wax-like fatty acid in animal derivatives and also, vegetable fats. Furthermore, Alcohol Denat. acts as a solvent, but also brings antifoaming, antimicrobial, astringent and viscosity controlling properties. Both Hydrated Silica and Talc work as abrasive, opacifying, absorbent, anti-caking, suspending, bulking and viscosity increasing agents. They enable coats to be smoother, increase volume of the product and get rid of excess water or oil within the formula. Propylene Glycol is a type of humectant or water carrier, which is able to avoid draining out and stiffening hair. It helps maintain the flexibility of lashes. Hydroxyethylcellulose is a plant-derived amino acid and water-soluble polymer, used as a thickener, binder, emulsifier or preservative. Also, it’s inclined to make other emulsions stay stable in the formula. Laureth-21 functions as a surfactant, solubilizer and cleansing agent. Its solubilizing property helps improve the solubility of other ingredients and enable the even dispersion of pigment on every coat. Triethanolamine is a surfactant, fragrance and also pH adjuster. Associated with preservatives, including Phenoxyethanol and Ethylhexylglycerin, to basically keep the propagation of microbes at bay. Last but not least, the mascara is infused with mineral pigment, Iron Oxide. 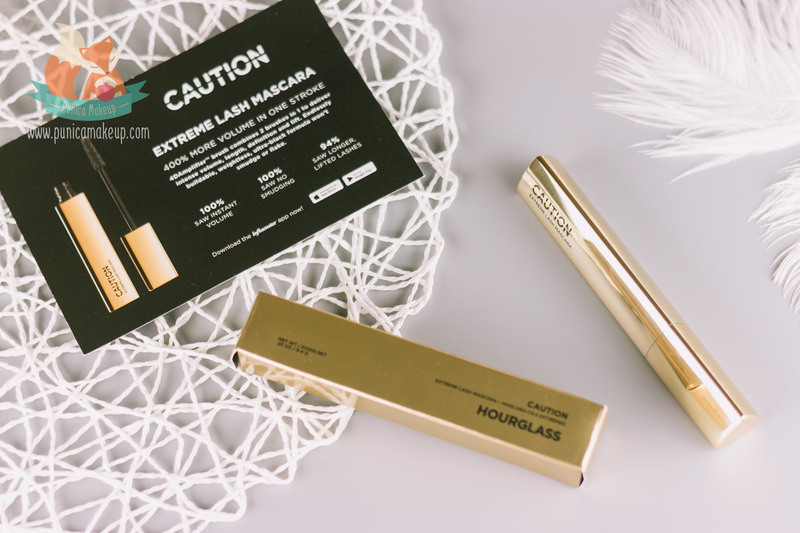 Hourglass Caution Extreme Lash Mascara truly results in a makeover with great volume and obvious lift. Also, It slightly curls up my lashes, I still need my lash curler before applying the product. It only smudges when my skin gets oily under eyes and clumps a bit because of excessive product clutching the wand. If take a closer look, you can see some tiny chunks on the lashes. But, they are not overwhelming. Plus, the mascara is not waterproof. I know we all are intrigued about whether the epic words behind this product are true or not, “is it really as amazing as it looks?” Sit down, now is the time to spill tea over it, girls! Top of all, the mascara power may be considerably thanks to its pretty large wand, alongside the effective formulation. With the big, classic-shaped brush, it creates intense volume and length to lashes. Instantly flicks out my upper and lower lashes as well as opens up my eyes. The product causes neither irritation nor heavy, sticky feeling like some other mascaras I used earlier. Also, it’s not awkwardly stiffening my lashes, l still find them flexible enough. So, this makes me want to hold it for my everyday makeup routine. You can see the change immediately in one stroke and next, swipe on two additional coats for a bold, dramatic look. I try to press and sweep upward in a zigzag motion. With the technique and one to two dips, it literally gives a full, extremely lifted look. However, meticulously, I prefer doing an initial coat of mascara all over my lashes from root to tip with a smaller brush. The smaller applicator is inclined to achieve more precision and set the lashes separately in the very beginning. 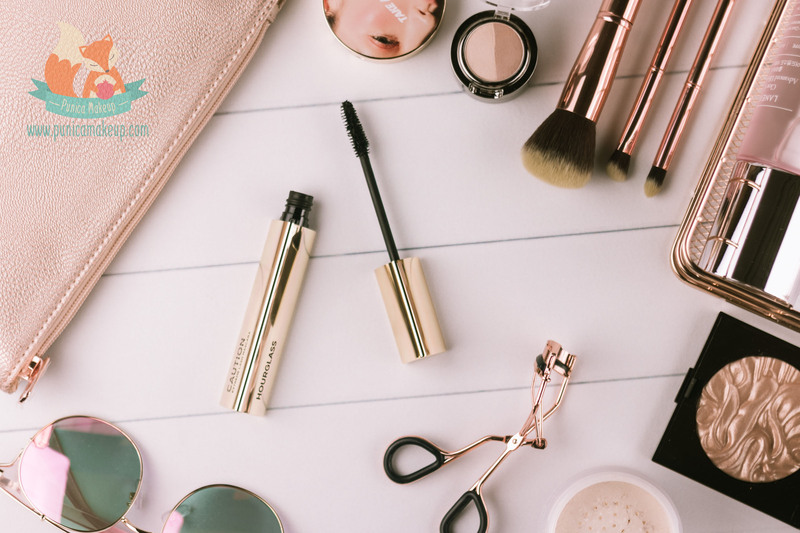 Then, wiggle back and forth at the base of lashes from the center to the outer corner of my eyelids with the bigger brush of the Hourglass mascara for a boost of volume. You can blink while applying to get the very ends of your lashes. If you are wondering if it clumps, yes it does. Also, two to three lashes stick together and take a very close-up, you can see tiny chunks on the lashes. But it’s not like clumping annoyingly, the product still fans the lashes out. To be fair, too much product is prone to cling to the brush day by day and hence, cause clumps and chunks on my lashes. Many mascaras with big brushes often get into that same damn situation. Therefore, to minimize the clumps, run a dry lash comb through them to separate lashes and add more definition. Moreover, scrape the brush up against the inside of the tube and use a tissue to wipe off excess product from the wand. Speaking of whether it’s smudge-proof, I may half agree that. I mean it’s not regularly smulging. Even if I blink while applying, it will not smear around. There may be a bit black streaks left beneath my eyes. Not a big deal. I just use a cotton swab to gently remove them. 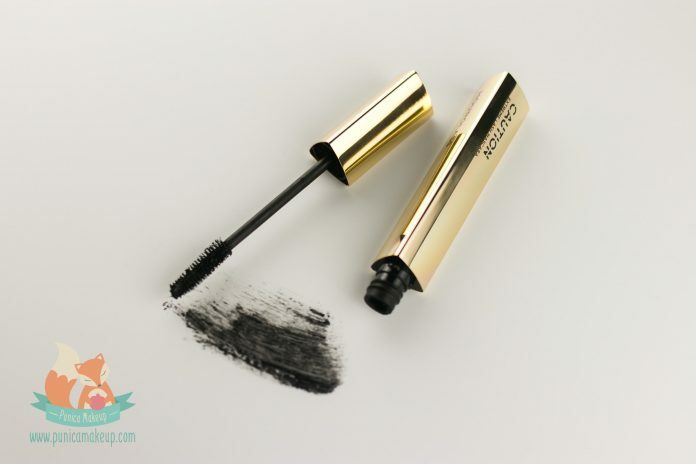 The mascara is fairly fast-dry, prone to set in place and be smudge-free after a few seconds. Nevertheless, it still causes smudges in some particular circumstances. For instances, in case of heading outdoor a lot in sultry weathers, my skin tends to heat up and get greasy. That melts down the mascara, it slides beneath my eyes. Plus, slathering too much moisturizer all over your face can drag your mascara into the quicksand. Therefore, on the days after, I do setting powder or blotting paper on my lids and under-eyes beforehand to stop oil from breaking through. The mascara cannot stand the water, it tends to crumble off. So, not very suggestive on swimming and rainy days. But, you know what? This turns out that I can easily remove it and let my lashes free from makeup at night. As I said, the product does enhance my eyelashes with slightly curling effects. To get the most out of it, I love applying eyelash primer before utilizing lash curler and the Hourglass mascara. This genuinely brings out lush, fluttering eyelashes, a secret weapon to capture your crushes, girls! Unfortunately, there is only one shade available right now, ultra-black, which may not be very universal for all girls, especially who have brighter hair colors. Furthermore, the product’s pretty big wand seems more desirable for dollies who are born with long, thick lashes. To be honest, this is the most beautiful and luxurious mascara I have ever had. I was literally dazzled when I first saw it. Otherwise, it’s pretty big and heavy, quite taking up space in my makeup bag. Not very ideal for traveling though. 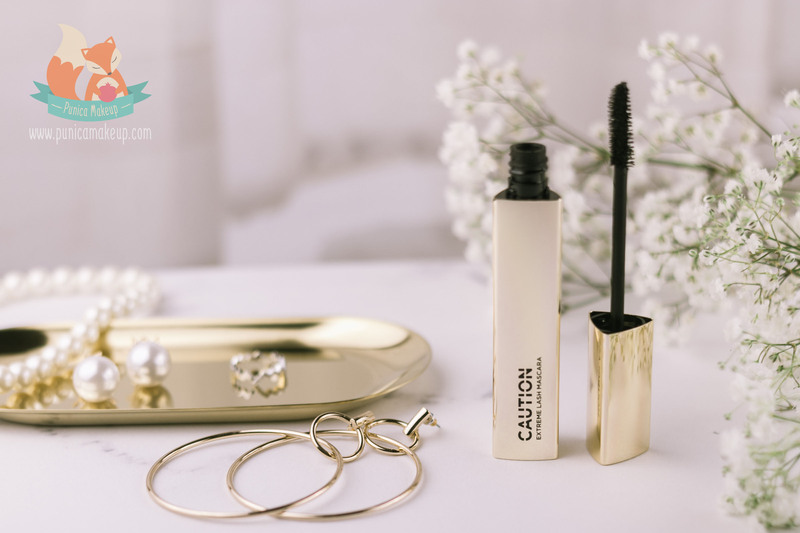 The mascara comes to a quite long and big tube with a shiny golden color as a whole. Twist open the lid, which comes along with a black brush wand as usual. 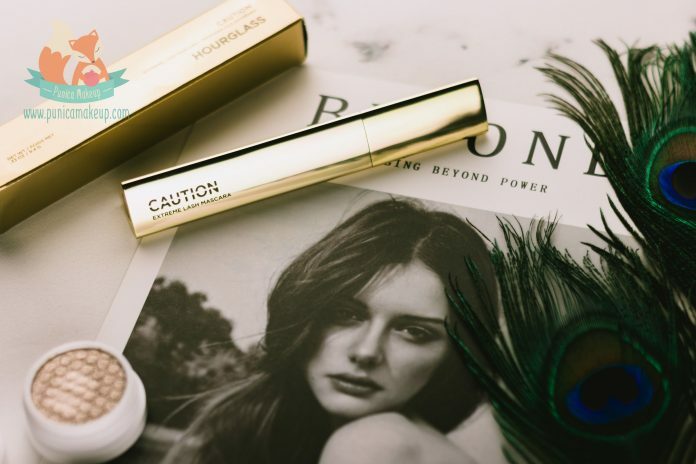 There are the brand and product names, Hourglass Caution Extreme Lash Mascara on the tube. you can find further information, typically the product ingredients, on its cardboard box. This mascara really deserves your love and attention, except that it’s quite pricey though. I definitely recognise the intense volume and lift to my lashes. I’ll give it 8 out of 10. Hope that the review is not too boring. I’m so happy that we have gone through all of this about Hourglass Caution Extreme Lash Mascara. Please let me know your thoughts, I’d love to hear you out. Sincerely thank you so much for spending time with me! This is the obvious disclosure: “I received these products complimentary from Influenster for testing purposes.” All opinions expressed are my own.